Cooked organic borlotti beans (also called cranberry or rosecoco beans) with no added salt. Creamy, plump, and chestnut-like in flavour, they’re an unsung star of the store cupboard. Toss them straight into soups, stews and casseroles. Or, for a simple side, add wilted seasonal greens, olive oil and a squeeze of lemon – and you’re done. Throw them into a hearty soup, stew or casserole – minestrone, ribollita or pasta e fagioli. Mix with tuna, beans and red onions for a quick summer salad, or make a simple side for meat or fish by heating them with garlic, rosemary and olive oil. 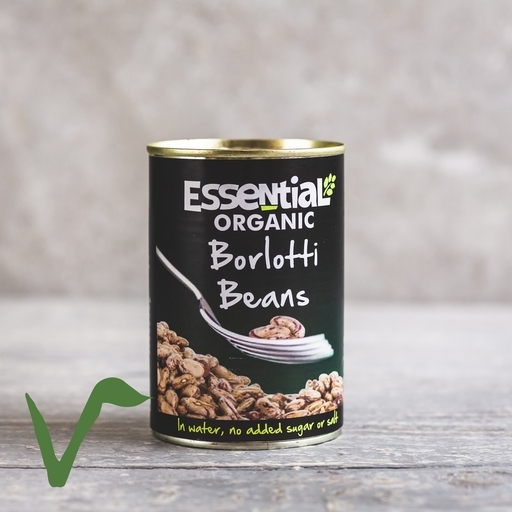 Unopened borlotti beans can be stored indefinitely. Once opened, don’t keep your beans in the tin – turn them out into a covered bowl and they’ll last for 3 or 4 days in the fridge. They can also be frozen, though their texture becomes a bit mushy when thawed, so they’ll be better for stews than adding to salads.